I'm still marching my way through the Tall Pat records that I picked up while in Chicago to see Drive Like Jehu. While I had known that I fell somewhat behind on things, I didn't realize it had gotten so bad that I hadn't bought albums that had come out in 2014. Well, shame on me because that's when this Son of Gun LP was released. I couldn't tell you why I was denying myself this album. Son Of A Gun are another in a line of great bands playing that Tall Pat Sound ℗. Son Of A Gun just tear through the album's twelve tracks, leaving a pile of hooks and energy to spare in their wake. You're going to get the catchy choruses that keep me coming back to the table, but the songs all have that slight grimy haze to them that keeps things crunchy and honest. When No Bread is firing on all cylinders, the band takes the very best moments of 60's garage trash, but filters it through a modern lens, never sounding like a rehash of something from the past. It's an impressive balancing act and one I can't see many bands being able to pull off like this. If you can't tell, I really dig these guys. 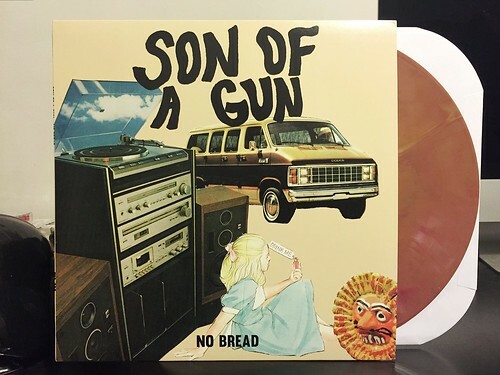 If you like your rock leaning on the garage side, but you still want catchy songs and a strict avoidance of psych-rock trappings; Son Of A Gun is absolutely worth checking out.